Regulation of gene expression is one molecular mechanism that would be expected to lead to relatively stable changes within neurons. According to this scheme (see figure to the right), repeated exposure to a drug of abuse, by causing repeated perturbation of intracellular signal transduction pathways, would lead eventually to changes in nuclear function and to altered rates of transcription of particular target genes. Altered expression of these genes would lead to altered activity of the neurons in which those changes occur and, ultimately, to changes in the neural circuits in which those neurons operate. The result would be stable changes in behavior. 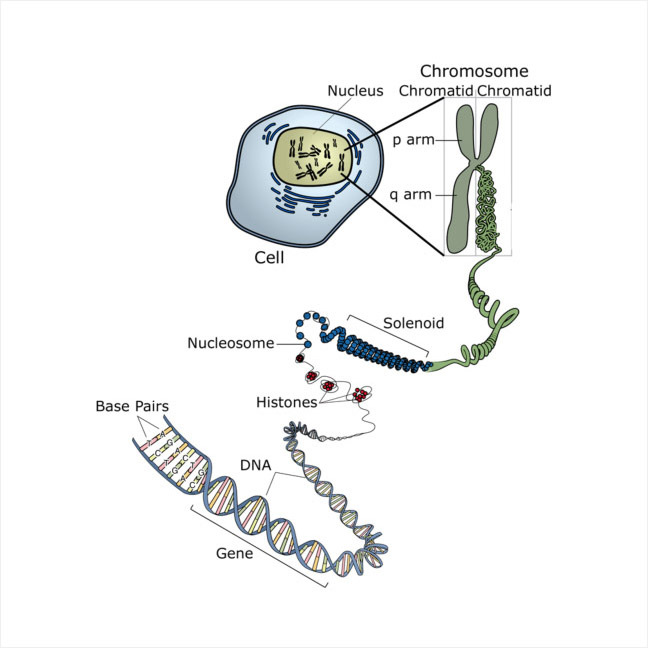 The rate of expression of a particular gene is controlled by its location within nucleosomes (that is, its chromatin structure) and by the activity of the cell's transcriptional machinery. A nucleosome is a tightly wound span of DNA that is bound to histones and other nuclear proteins (see figure to the left). Transcription of a gene requires the unwinding of a nucleosome, which makes the gene accessible to a basal transcription complex. This complex is comprised of RNA polymerase (which transcribes the new RNA strand) and numerous regulatory proteins (some of which unwind nucleosomes via histone acetyl transferase activity). Transcription factors are proteins that bind to specific sites (response elements; also called promoter or enhancer elements) present within the regulatory regions of certain genes and thereby increase or decrease the rate at which those genes are transcribed. Transcription factors act by enhancing (or inhibiting) the activity of the basal transcription complex, in some cases by altering nucleosomal structure through changes in histone acetyl transferase or histone deacetylase activity of the complex. We are gaining an unprecedented view of how repeated exposure to drugs of abuse induces long-lasting changes in the expression levels of particular genes within the brain’s reward circuitry through regulation of numerous transcription factors (e.g., CREB, ?FosB, NFkB, among others) and chromatin regulatory mechanisms (histone acetylation and methylation, DNA methylation, etc.). 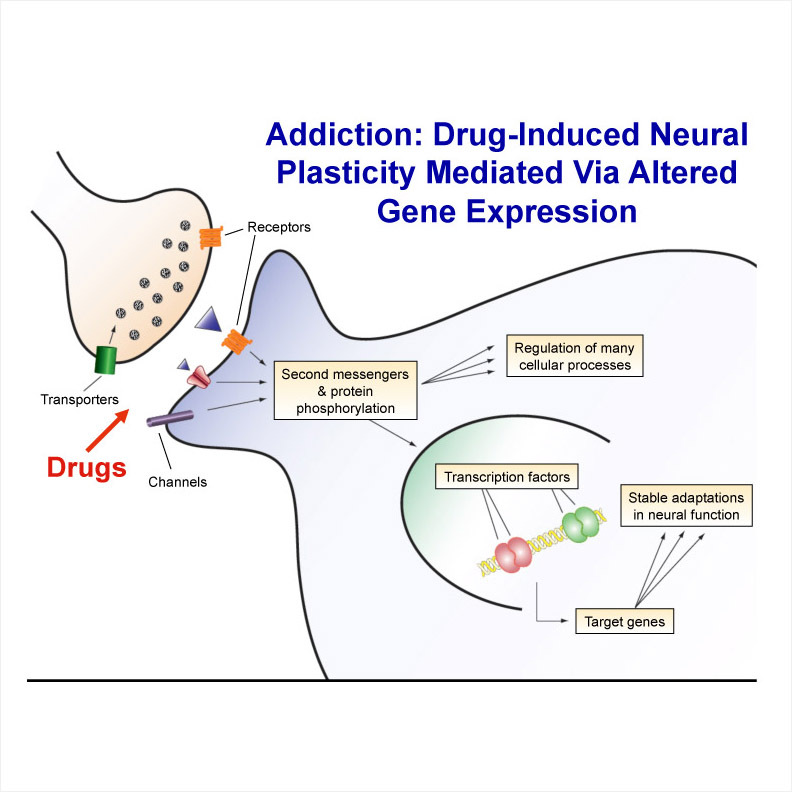 Together, these drug-induced changes define the “epigenome” of addiction.